Heatmiser SmartStat is a WiFi Connected Thermostat that replaces your existing thermostat and programmer and is perfect for those with a combi-boiler. It has been designed for wired systems, so there are no concerns over replacing batteries. Don’t worry we have your home covered. The in built frost protection feature will protect your home against the elements. 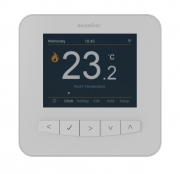 Gone are the days of having a separate programmer and thermostat – Smartstat is both in one so you no longer have to fiddle with the awkwardly positioned programmer. SmartStat has built in WiFi so connects directly to your home router. As SmartStat connects to your SmartPhone via our Cloud Server setup is a dream and will take minutes – no technical setup here. Now is the time to re-think how you heat your home. SmartStat lets you have different temperatures at different times of the day, not only an energy saving feature but one that creates for a more comfortable living environment too. 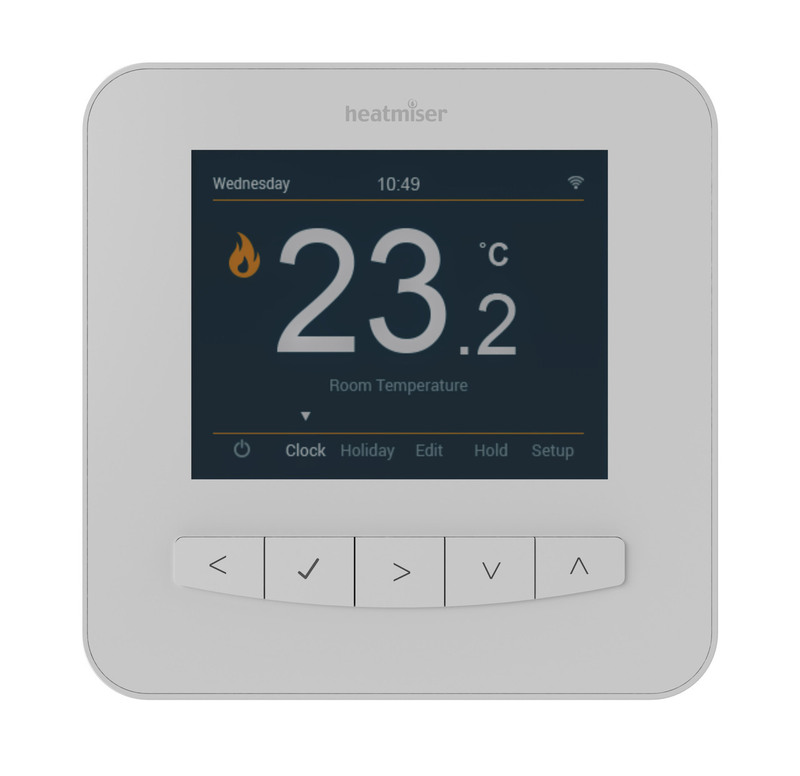 The Self Learning Optimum Start feature will automatically calculate when your heating should turn on, so it’s one less thing for you to worry about. The Heatmiser SmartStat App lets you control your heating from anywhere. iPhone, iPad and Android Phone and Tablet devices are supported. Geo Location is an exciting new feature that makes it even easier to reduce your energy costs. SmartStat will lower the temperature in your home when it detects the last person has left and will turn the heating back on when it will detects someone is on their way home. Using the Location Services feature on your iPhone or Android SmartPhone, SmartStat can now help you reduce your energy consumption by turning the heating off when you’re out. 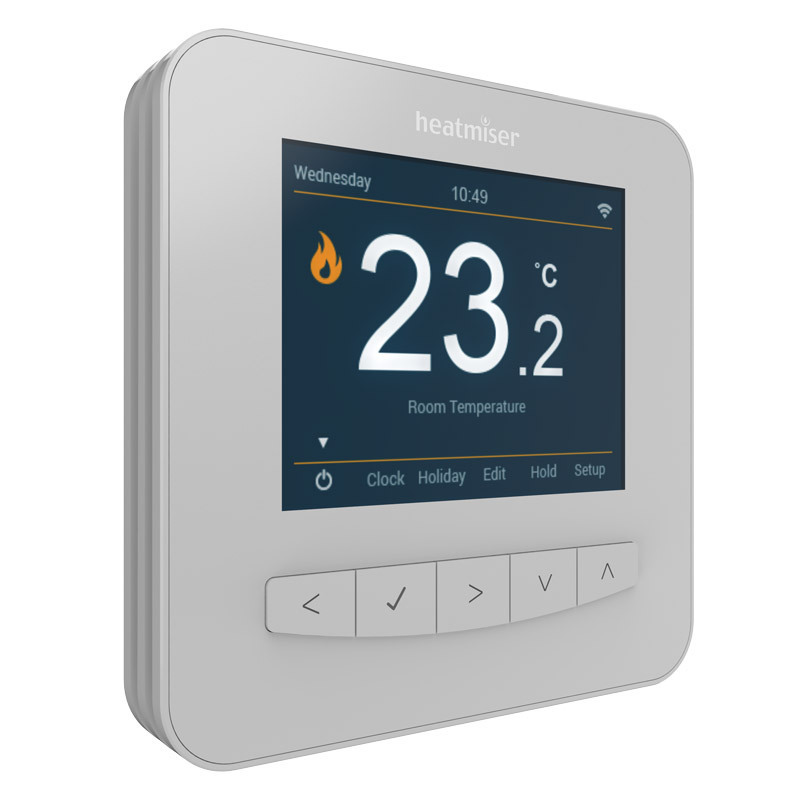 The Away feature lets you decide whether to turn down the heating permanently or for a number of days. Your home will automatically reduce in temperature, saving you energy whilst at the same time protecting your home against frost damage. Your SmartStat can be set to work in a number of programming modes, to match your lifestyle. 5/2 Programming is ideal for those who work during the week and rest at the weekend, 7 Day programming is for those with unpredictable hours and 24 Hour programming is for those with the same schedule for each day of the week. The SmartStat App automatically detects your chosen programming mode and enables you to program your comfort levels with ease. Staying up later than normal shouldn’t mean you have to battle with your heating programmer. 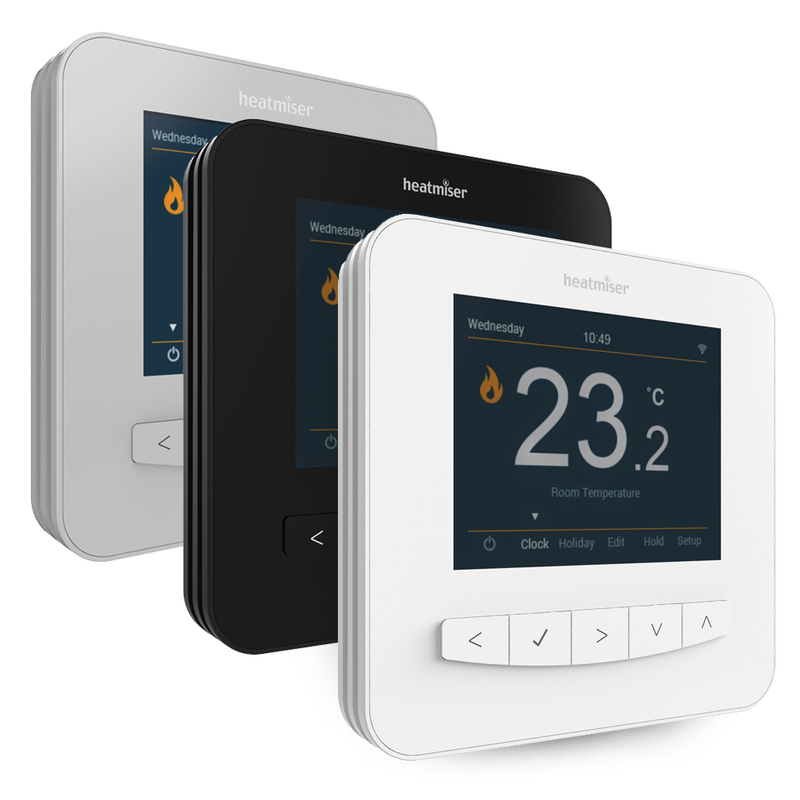 The Temperature Hold feature in the SmartStat App lets you set a hold temperature for a number of hours and at the end of the hold period, SmartStat will automatically revert back to its normal program. Simple and Smart.